A chocolate brown dial is the hallmark of every Rolex Chocolate. Watches with these dials can be found in many of the Swiss luxury watch manufacturer's most popular collections. Most are made of 18-karat Everose gold. Brown dial nicknamed the "chocolate dial"
What is a Rolex Chocolate watch? Although some collectors may refer to vintage Rolex models with faded black dials as chocolate, this term actually applies to any watch Rolex has outfitted with a brown "chocolate dial" . 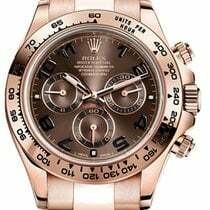 Some of the most sought-after Rolex Chocolate models include the Cosmograph Daytona, the Day-Date, and the Datejust. However, the Sky-Dweller and the Yacht-Master are also available with a brown dial. 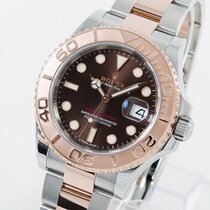 Rolex usually combines these brown dials with cases made of their own 18-karat rose gold, also known as Everose gold. That being said, there are also some bicolor models made of stainless steel and gold. 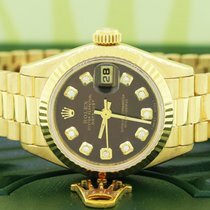 Rolex embellishes the dials of certain women's chocolate watches with diamond indices. We'd be remiss if we didn't mention that "Rolex Chocolate" can also be taken quite literally, as the Swiss luxury watch manufacturer also makes their own pralines. How much does a Rolex Chocolate cost? The Daytona has been a staple of the Rolex catalog since 1963. After a rocky start, this chronograph has gone on to become one of the manufacturer's most beloved models. Vintage models, such as the so-called "Paul Newman" are especially highly coveted: Paul Newman's personal Daytona sold at auction for a record 17.75 million USD in late 2017. Of course, a Daytona Chocolate is not nearly as expensive. These models feature cases made of 18-karat Everose gold and black Arabic numerals on the dial instead of the typical glow-in-the-dark indices. As with every Daytona since 2000, the in-house caliber 4130 with chronograph functions ticks away inside these timepieces. This movement comes with a chronometer certificate from the Official Swiss Chronometer Testing Institute (COSC). It deviates a maximum of two seconds per day and has a 72-hour power reserve. Currently, the Daytona Chocolate is available with a three-piece link, Everose gold Oyster bracelet or a black Oysterflex bracelet. The latter is made up of metal inserts that are then coated with elastomer. Unlike the models with a leather strap or Oysterflex bracelet, versions with a rose gold Oyster bracelet also have a bezel made of Everose gold. Rolex equips the other models with a black Cerachrom ceramic bezel featuring a tachymeter scale. You can get a pre-owned Rolex Daytona Chocolate with an Oysterflex bracelet in very good condition starting around 22,700 USD. Mint-condition examples are only a few thousand dollars more expensive at about 26,600 USD. 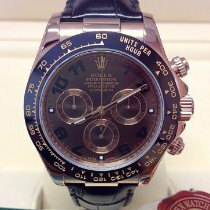 A pre-owned Chocolate Daytona with a rose gold bracelet costs approximately 28,200 USD, while a never-worn version demands around 31,300 USD. The Datejust is a classic Rolex watch. The Genevan manufacturer first introduced the model in 1945. The Datejust is one of the first automatic chronometers with a date display. Distinctive features of this watch include its ruffled bezel and Cyclops lens over the date display. The watch is available in countless versions and different sizes, ranging from a 28-mm ladies' platinum watch with diamonds to a 36-mm stainless steel model, all the way to a 41-mm gold version. One of the Datejust's most famous wearers was former US President Eisenhower. There is also a chocolate edition of the Datejust. With such a wide selection of timepieces with chocolate-colored dials, there is truly a watch for every taste. Set aside around 12,200 USD for an unworn 41-mm bicolor model in stainless steel and Everose gold. A pre-owned model is only marginally less expensive at 11,900 USD. The 36-mm unisex versions go for prices between 9,600 USD for a pre-owned timepiece and 10,900 USD for a new one. 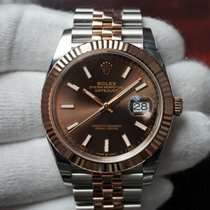 If you prefer the 28-mm rose gold Datejust Chocolate, be prepared to spend at least 24,600 USD. The same watch with diamond indices costs around 35,600 USD. The Rolex Day-Date has been telling the time, date, and full day of the week since 1956. It was the first wristwatch that offered this function. To this day, the Day-Date is only available in gold or platinum. In the past, the watch enthralled those with power and influence. Famous wearers of the so-called "President Watch" include Fidel Castro and investor Warren Buffett . A 40-mm, solid gold Day-Date Chocolate with a president bracelet costs 31,900 USD new. With diamond indices, the price of this watch climbs to nearly 42,400 USD. You can get the 36-mm unisex version with a leather strap starting around 19,500 USD. Prices for the timepiece with an Everose gold bracelet and a diamond and ruby studded dial sit at about 30,100 USD. The Rolex Yacht-Master is geared toward watersport fans and skippers . The classic models in this collection have case diameters of 37 or 40 mm. The newer Yacht-Master II, a regatta chronograph, is one of the largest watches offered by Rolex, coming in at 44 mm in diameter. The Rolex Chocolate Yacht-Master is currently only available as a bicolor model made of stainless steel and rose gold, called Rolesor. Other variants are made of 18-karat Everose gold or the exclusive material Rolesium, a combination of stainless steel and platinum. The caliber 3135 powers the current 40-mm watches, while the smaller caliber 2236 powers the 37-mm versions. Both calibers are certified chronometers. The Yacht-Master's design is reminiscent of the world-famous diving watch Submariner. Both models have a date display at three o'clock with the characteristic Rolex Cyclops lens . However, unlike the Submariner, the Yacht-Master is only waterproof to 100 m (10 bar, 328 ft). The Submariner is waterproof to 300 m (30 bar, 984 ft). Another difference is the Yacht-Master's bidirectional bezel, which you can use as a timer. On a diving watch like the Rolex Submariner, the bezel can only be turned counterclockwise. This mechanism ensures safety while diving; you can't accidentally turn the bezel and increase your dive time, you can only shorten it. The Rolex Chocolate Yacht-Master has an 18-karat Everose gold bezel. The numerals and markers are raised and polished. The bezel, on the other hand, has a matte finish. The Sky-Dweller is one of the most complex watches that Rolex has ever developed. The manufacturer presented this wristwatch with a GMT function in 2012. Like the GMT-Master, one of the most famous wristwatches with a second time zone display, the Sky-Dweller displays two time zones at once. The local time is displayed using the three normal hands. When you change time zones, you can easily change the hour hand in one-hour increments forward or backward using the crown. The second time zone is displayed via an additional 24-hour ring. A red triangle points to the time back home, for example. The 24-hour scale ensures you'll only need one glance to tell if it's day or night. The Rolex Chocolate Sky-Dweller has a 42-mm pink gold case. You have the choice between a brown alligator leather strap and an Everose gold Oyster bracelet with polished middle links. These give it a more elegant look than the Oyster bracelet on the Submariner and Sea-Dweller. The diving watches feature satin-brushed links. The leather strap has a very refined look and goes well with classic attire. A fold-over Oysterclasp keeps the watch securely on your wrist. You can purchase a pre-owned example of the Sky-Dweller Chocolate in good condition with an alligator leather strap starting at around 28,200 USD. Models in mint condition begin at about 33,200 USD. Set aside at least 38,100 USD for a pre-owned timepiece with an Everose gold Oyster bracelet. The same watch costs around 40,500 new.